Short Stories From 10 Years Ago – March 30, 2004 – ‘Rainy Nights’ – so essential to our well-being, yet to hear people complain one would think we had to walk over hot coals in hell whenever it rains. Moaning, groaning and whimpering over a bit of water. Now a heavy snow fall in mid-April, that’s something to wail about. Not to say that I’m delighted when a rain shower interferes with my plans, but I get over it in short order and get on with my day. There are songs about the rain such as – ‘Rainy Days and Mondays Always Get Me Down’ – Singin’ in the Rain, Rhythm of the Rain, Don’t Rain on My Parade’ and “Rainy Night In Georgia”. Where would these songs be without the rain? Where would we be without the rain? It’s said that April showers bring May flowers and I personally welcome these early spring days when it’s overcast and raining. It washes away the last traces of the dull ice and snow and freshens the landscape. I can already see the tiny buds forming on the Hornbeam tree outside my office window and the rain is washing the dirt from my deck and refreshing the green shrubbery in my garden. As I was driving around the city today, listening to the steady swish – swish of the windshield wipers on my car windshield, I thought about a wonderful walk I had in the rain many years ago. I think I was in grade 13 at the time and I was dating a guy named Jim. We’d been to a dance at my favourite old haunt – the Sauble Beach Pavilion, and due to a mix up with friends about a meeting time, we’d been left behind at the end of the dance. Jim’s car was at my cottage so we decided to walk home. It was about three miles from the dance hall to the cottage, so we decided to walk along the beach as far as we could before hooking up with the road that curved around the north end of the beach, and ran along the river to where my cottage was located. We took off our sandals, rolled up our jeans and trotted down to the water. We held hands as we walked along the sand, wandering in and out of the lake and splashing each other like ten year olds. It was a sultry summer night and the air was warm and sticky. We’d been walking about half an hour when it started to rain. It wasn’t a heavy shower, but a soft, misty rain that dribbled down our hair and beaded on our faces. It was so light and sweet and refreshing that we stopped and looked up at the sky, opened our mouths and let the rain fall all over us. It didn’t enter our heads to run for cover. We just wandered along, soaked to the skin, enjoying each other and the night. We reached the turn at the end of the beach and walked up through the dunes to the beach road. It kept raining, we kept walking, talking and stopping to kiss and hug along the way. It took us over three hours to get home. I never wanted that night to end. I remember it as such a simple, yet highly sensual and romantic experience. Wherever you are Jim – I wonder if you ever think back on that wonderful, summer night. I hope you do! I had another wonderful, warm summer night a few years later with a man named Peter. I was in the Lake District in England and I met Peter one afternoon in a pub. Oh, I know what you’re thinking – guy meets gal in a bar. But it wasn’t like that at all. We just really enjoyed talking to each other. He was nursing a broken heart and had come up to stay at a camp ground for a few days to think and be alone. We had dinner together and were walking back to the hotel where I was staying. It started to rain – not the aforementioned soft, misty rain but a deluge of torrential proportions. His tent was closer than my hotel so we made a made a mad dash for it. Safely inside, he gave me a warm, fleecy sweatshirt to put on and then we sat on cushions at the front of his tent and watched the storm. 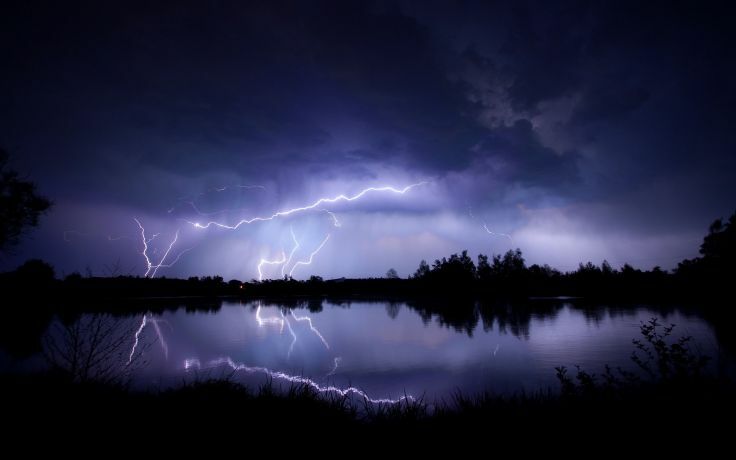 The lightening repeatedly split the sky open with great jagged flashes and the thunder crashed so loudly we could hardly hear each other speaking. The rain continued to pound down on the earth and then ricochet off the ground. The storm hammered us for about an hour and then quieted to a lighter, steady rain. We sat and talked and listened to the water ping off the roof of the tent. The lightening still flashed across the sky occasionally as the thunder became a distant rumble. Peter told me about his life (he was an artist), his former fiancee and their bitter break up. He was in such pain and I felt so helpless to comfort him, but there was something so refreshing and cathartic about the storm that he seemed a little hopeful by the time the rain stopped. Peter walked me back to my hotel. He kissed my cheek and thanked me for being a kind listener. He was gone the next day when I walked down to the pub for lunch. I never knew his last name or where he lived, but every time I’ve thought about that stormy night in England, I’ve hoped his life had turned out well. It’s raining lightly outside my window right now and the radio says the weather will be wet and unsettled all week. I don’t mind a bit. Soon the first real signs of spring will be upon us. The days will be longer and warmer as spring rains herald the summer. I have fond memories of other summers and rainy nights and I’m always open to adding another lovely memory to the ones I keep.